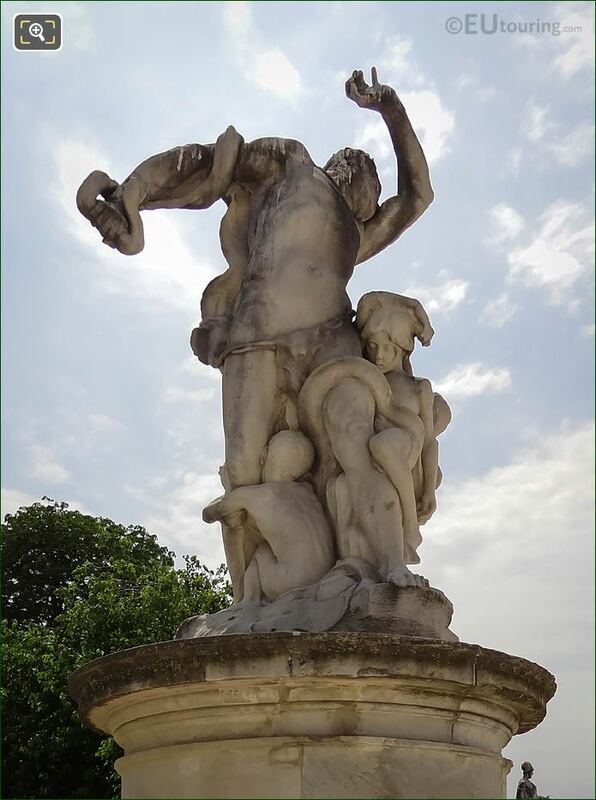 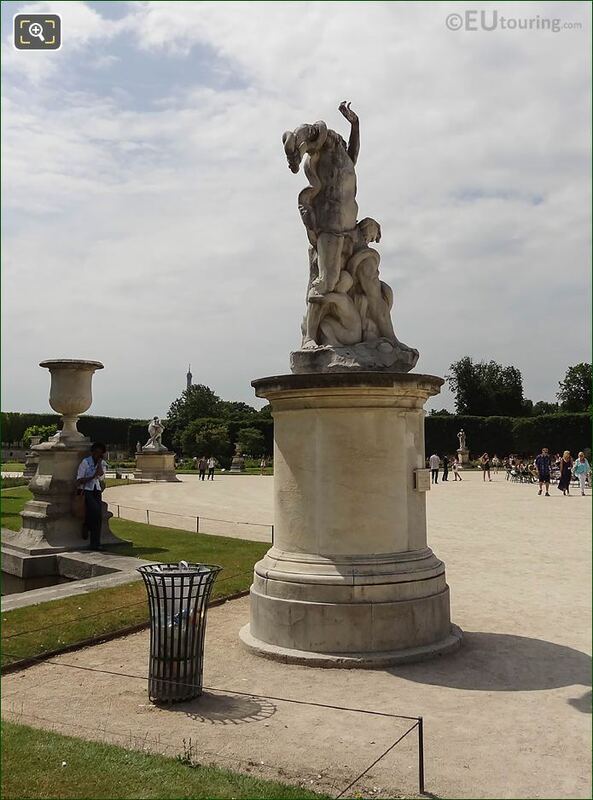 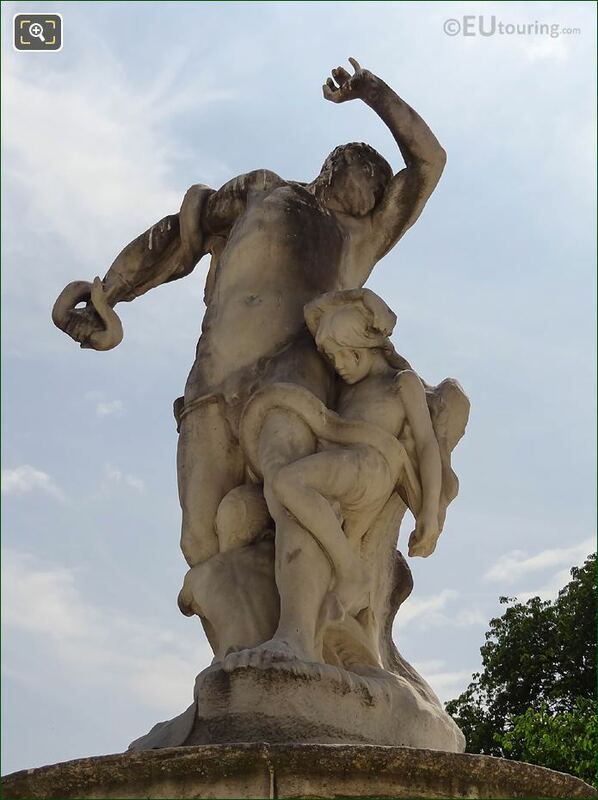 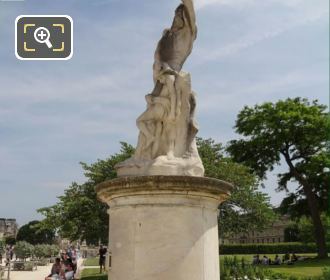 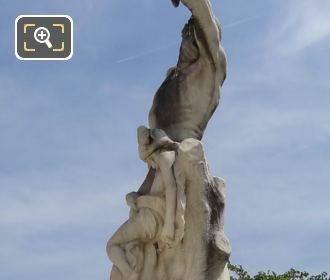 We were within the Jardin des Tuileries in the 1st Arrondissement of Paris, when we took these high definition photos showing a statue called L'Homme et sa Misere ou La Misere, which was sculpted by Jean Baptiste Hugues. This first HD photo shows the statue called L'Homme et sa Misere ou la Misere, which in English translates to The Man and his Misery or The Misery, and as you can tell this was placed on a large pedestal base. 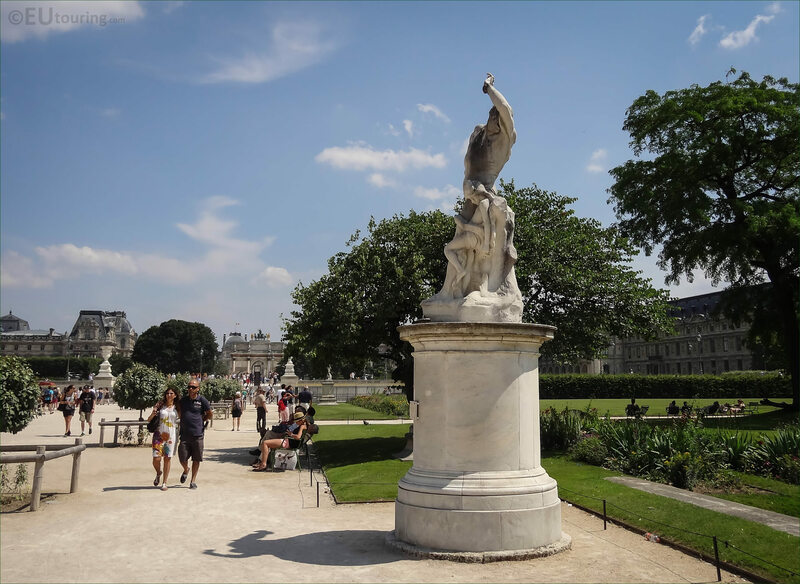 And this is located in the open area of the Jardin des Tuileries, that were originally laid out in a formal French style by Andre Le Notre, you will find that most of the statues in this part of the garden were sculpted in the 1800s and put in place in the same century. 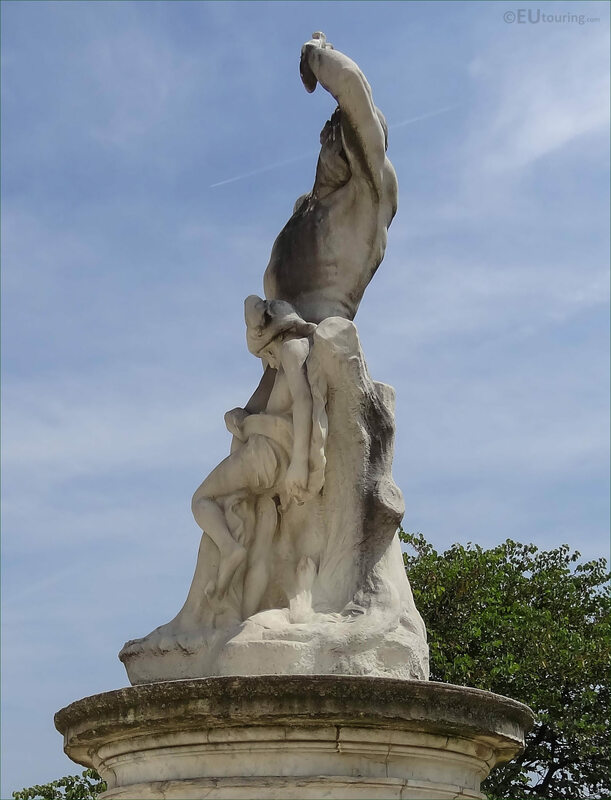 However, this particular statue of L'Homme et sa Misere ou la Misere was only sculpted in marble between the years of 1905 and 1907, by Jean Baptiste Hugues, who was born in Marseille in the south of France in 1849 and studied to become a French sculptor. Now this close up photograph shows a worried man holding away a serpent or snake with another that is on his thigh, while there are also two children in this statue group that are clinging on to his legs, as though they are scared. Yet this statue of The Man and his Misery or The Misery was not the most recognised work by Jean Baptiste Hugues, and although he is very little known today, he gained an excellent reputation during his lifetime, even winning the Prix de Rome in 1875. 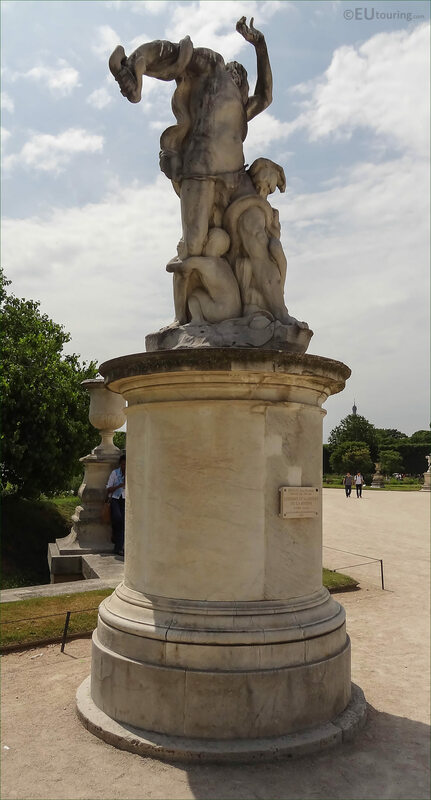 In fact it was upon his return from staying at the Villa Medici in Rome, furthering his studies of French sculpture, that Jean Baptiste Hugues started to receive several state commissions such as a bust for a fountain in Marselle, along with many orders for wealthy private individuals. 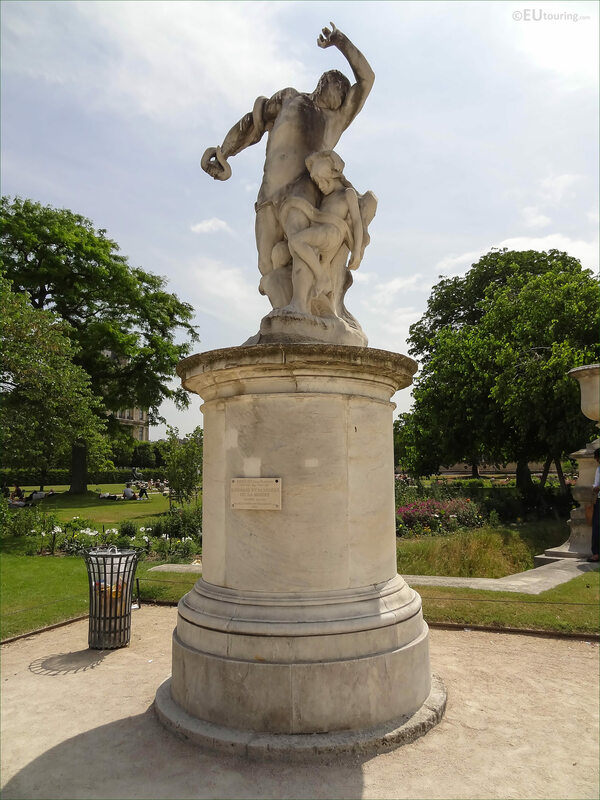 And Jean Baptiste Hugues spent most of his time in Paris, which is where he passed away in 1930, so hence why the popular tourist attraction called the Musee d'Orsay now holds some of his works, but he was diverse and as well as producing statues he sculpted busts along with creating beautiful ceilings for some of the impressive Paris restaurants. 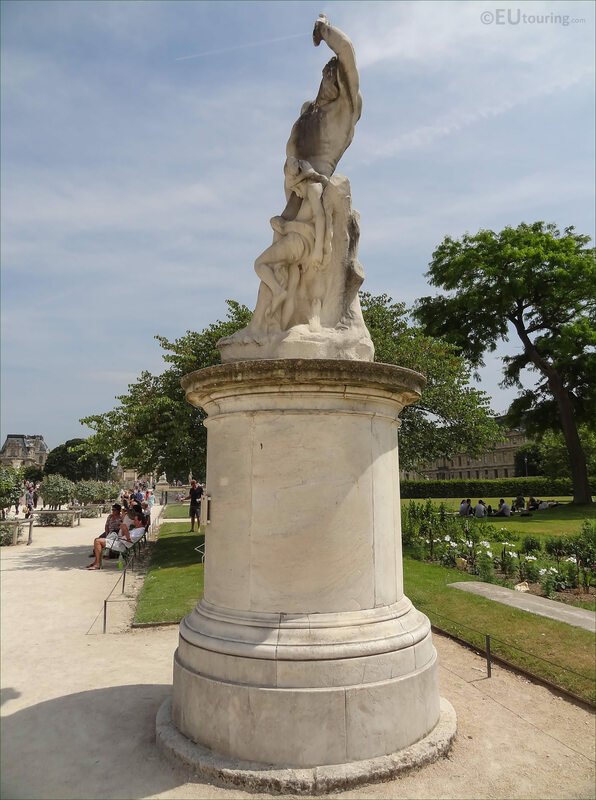 But there are still works like L'Homme et sa Misere ou la Misere that can be found in free public places throughout France, including this one within the Tuileries Gardens and the statue of Saint Martin on the dome of the basilica in Tours. 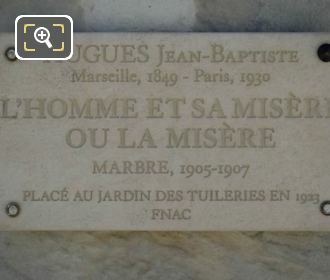 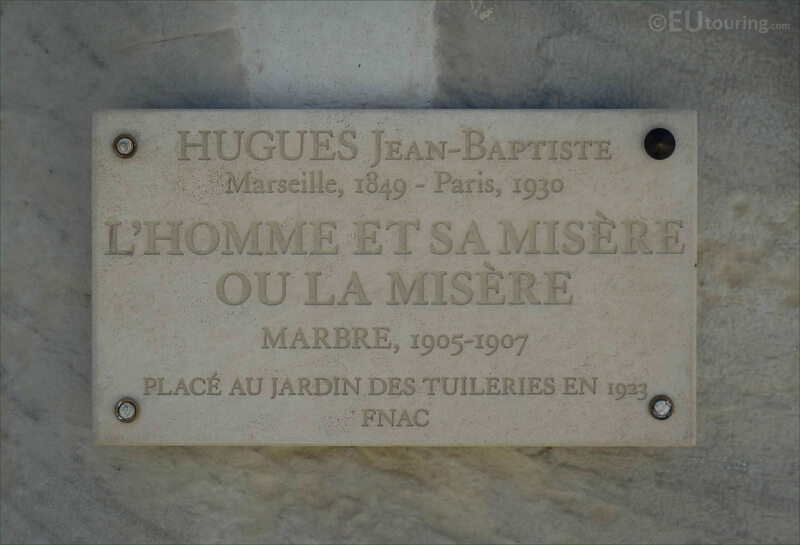 So this close up photo shows the plaque located on the pedestal base of the statue called L'Homme et sa Misere, or just La Misere, which as you can tell, was only placed within the Jardin des Tuileries in 1923, even though it was sculpted several years prior. 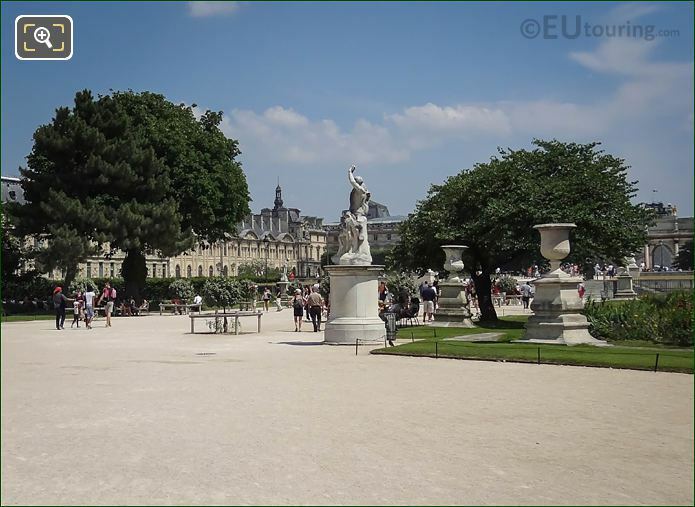 And in this last HD photo you can see the location of this statue, which is in the eastern part of the Tuileries Gardens in an area known as the Grand Carre, and if you look very carefully, apart from the Musee du Louvre, you can also see the steps going to the terrace where the Arc de Triomphe du Carrousel is located.